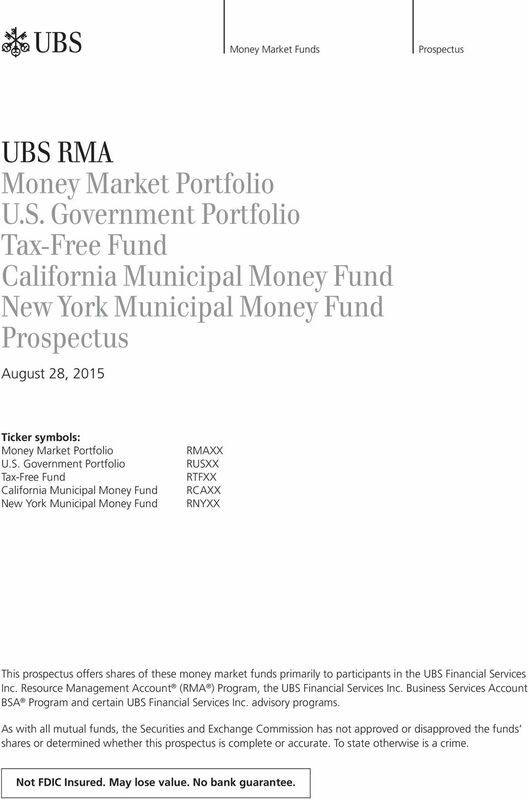 Download "UBS RMA Money Market Portfolio U.S. Government Portfolio Tax-Free Fund California Municipal Money Fund New York Municipal Money Fund"
6 Money Market Funds Prospectus UBS RMA Money Market Portfolio U.S. Government Portfolio Tax-Free Fund California Municipal Money Fund New York Municipal Money Fund Prospectus August 28, 2015 Ticker symbols: Money Market Portfolio U.S. Government Portfolio Tax-Free Fund California Municipal Money Fund New York Municipal Money Fund RMAXX RUSXX RTFXX RCAXX RNYXX This prospectus offers shares of these money market funds primarily to participants in the UBS Financial Services Inc. Resource Management Account (RMA ) Program, the UBS Financial Services Inc. Business Services Account BSA Program and certain UBS Financial Services Inc. advisory programs. 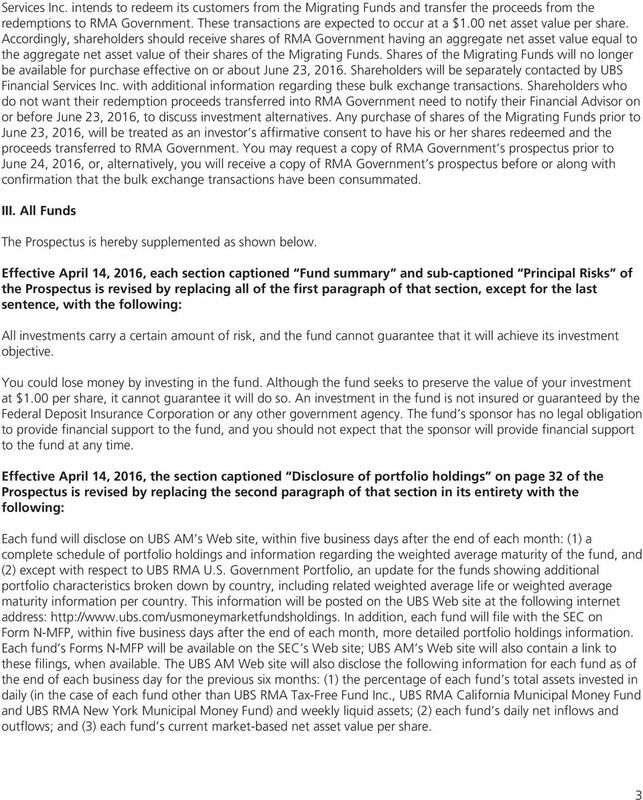 As with all mutual funds, the Securities and Exchange Commission has not approved or disapproved the funds shares or determined whether this prospectus is complete or accurate. To state otherwise is a crime. Not FDIC Insured. May lose value. No bank guarantee. 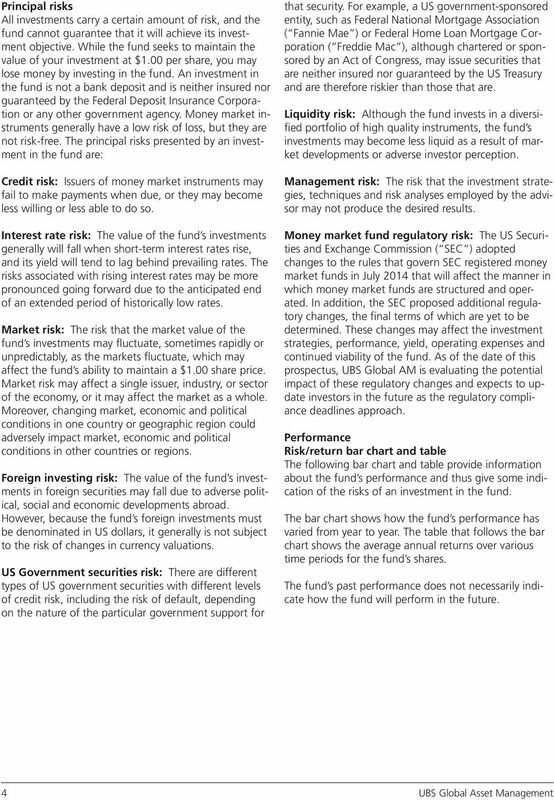 11 U.S. Government Portfolio Fund summary Investment objective Maximum current income consistent with liquidity and conservation of capital. 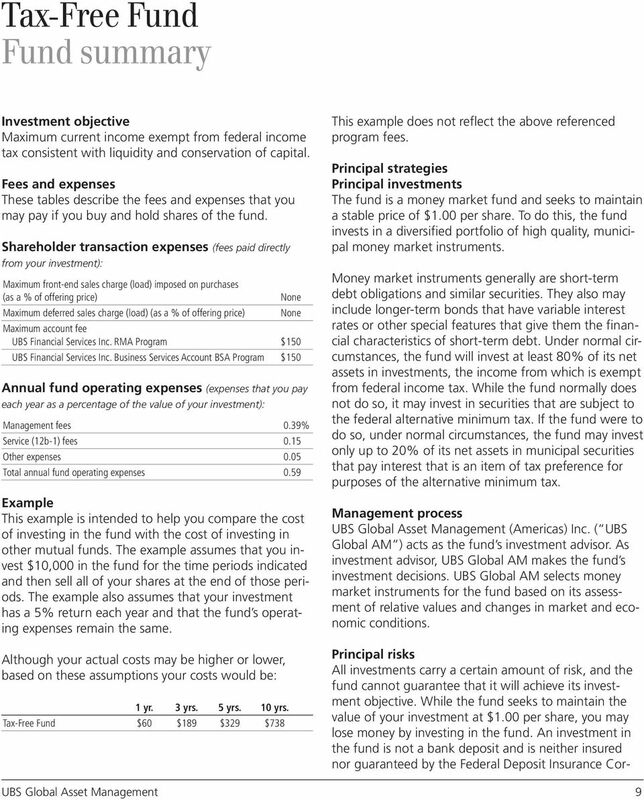 Fees and expenses These tables describe the fees and expenses that you may pay if you buy and hold shares of the fund. 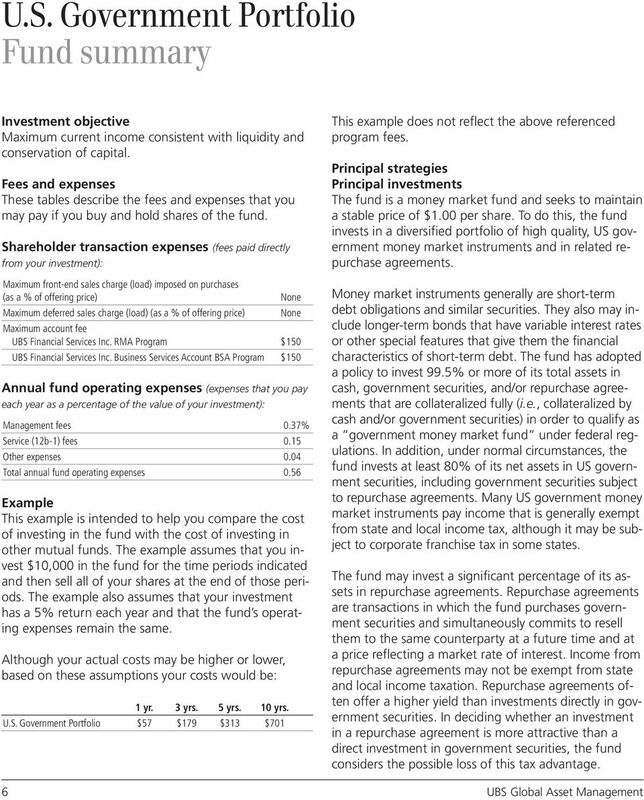 Shareholder transaction expenses (fees paid directly from your investment): Maximum front-end sales charge (load) imposed on purchases (as a % of offering price) None Maximum deferred sales charge (load) (as a % of offering price) None Maximum account fee UBS Financial Services Inc. RMA Program $150 UBS Financial Services Inc. Business Services Account BSA Program $150 Annual fund operating expenses (expenses that you pay each year as a percentage of the value of your investment): Management fees 0.37% Service (12b-1) fees 0.15 Other expenses 0.04 Total annual fund operating expenses 0.56 Example This example is intended to help you compare the cost of investing in the fund with the cost of investing in other mutual funds. 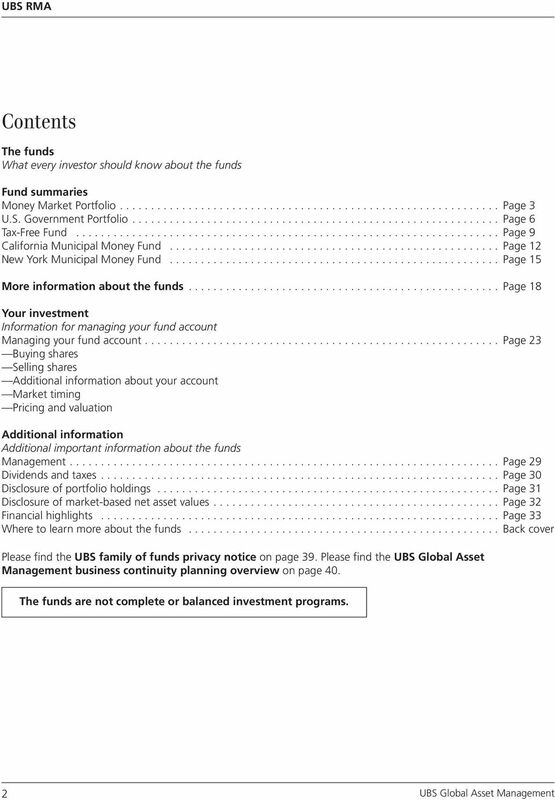 The example assumes that you invest $10,000 in the fund for the time periods indicated and then sell all of your shares at the end of those periods. 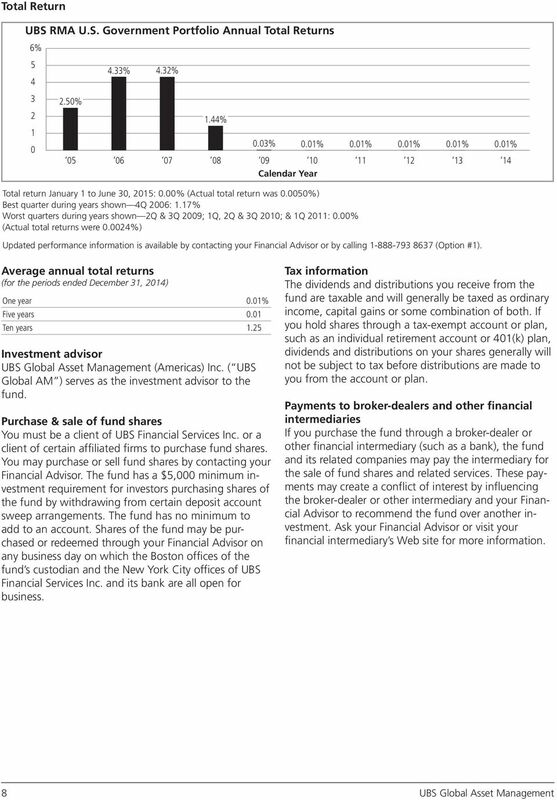 The example also assumes that your investment has a 5% return each year and that the fund s operating expenses remain the same. 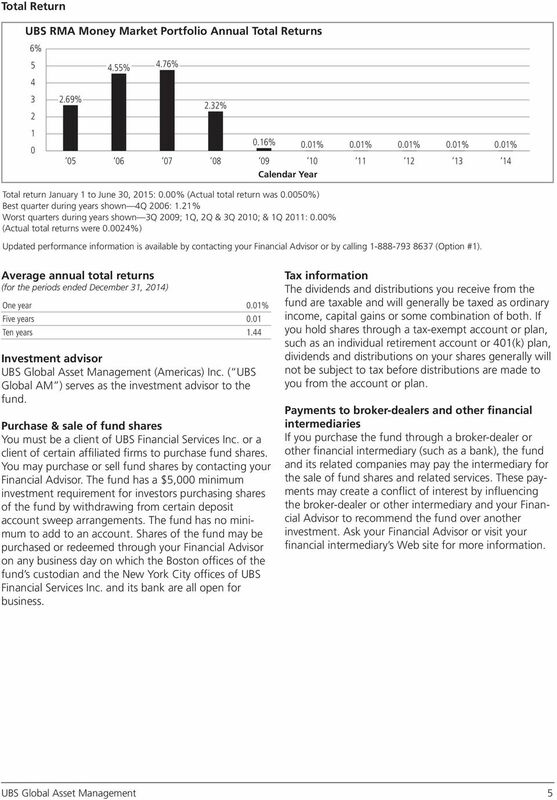 Although your actual costs may be higher or lower, based on these assumptions your costs would be: 1 yr. 3 yrs. 5 yrs. 10 yrs. 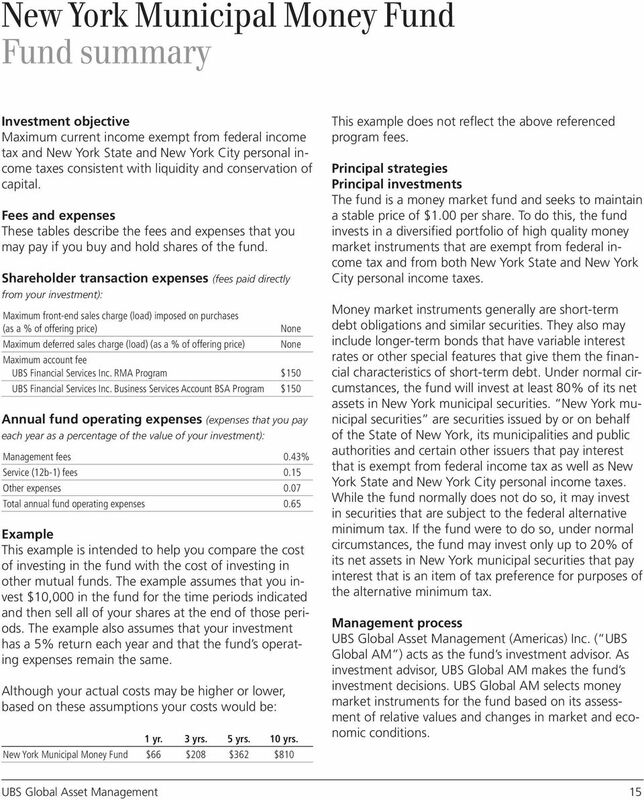 U.S. Government Portfolio $57 $179 $313 $701 6 This example does not reflect the above referenced program fees. 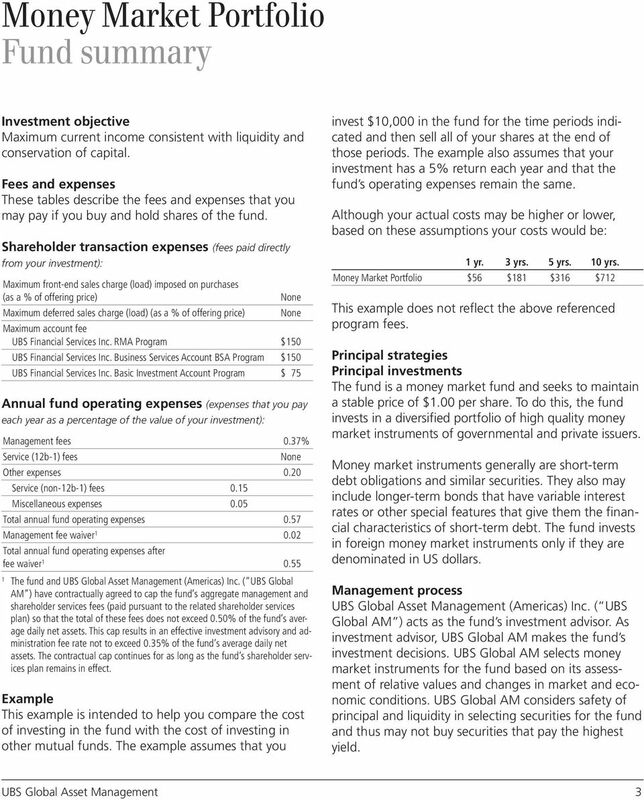 Principal strategies Principal investments The fund is a money market fund and seeks to maintain a stable price of $1.00 per share. 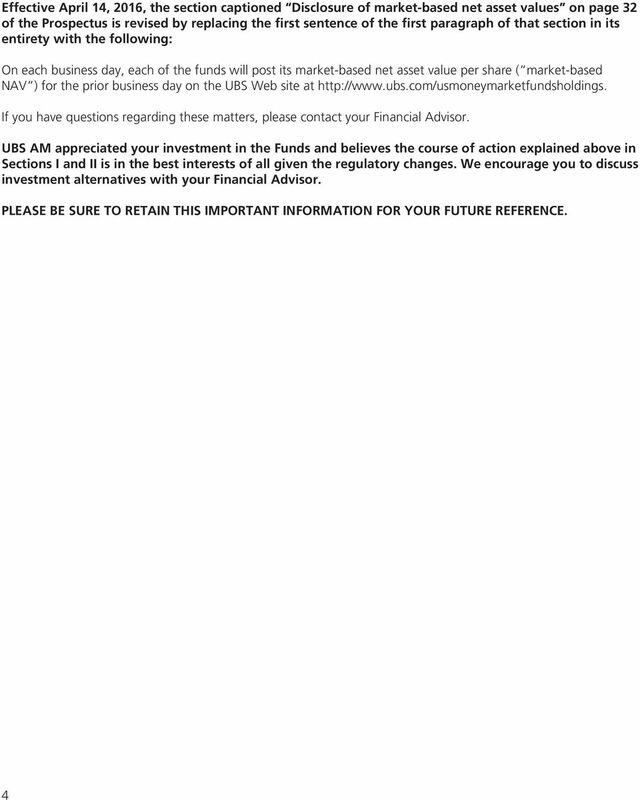 To do this, the fund invests in a diversified portfolio of high quality, US government money market instruments and in related repurchase agreements. 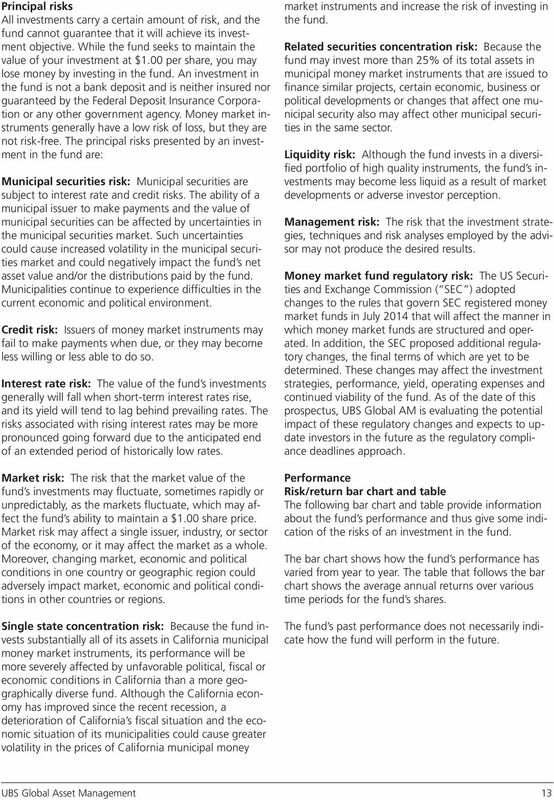 Money market instruments generally are short-term debt obligations and similar securities. 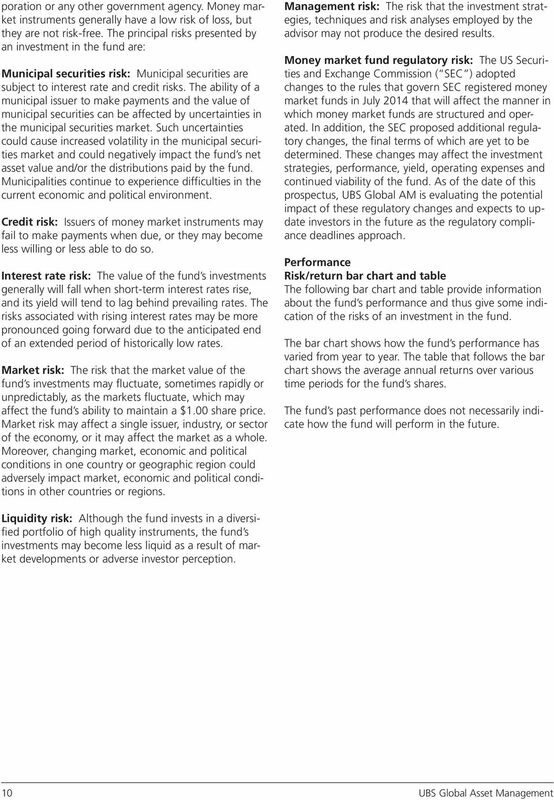 They also may include longer-term bonds that have variable interest rates or other special features that give them the financial characteristics of short-term debt. 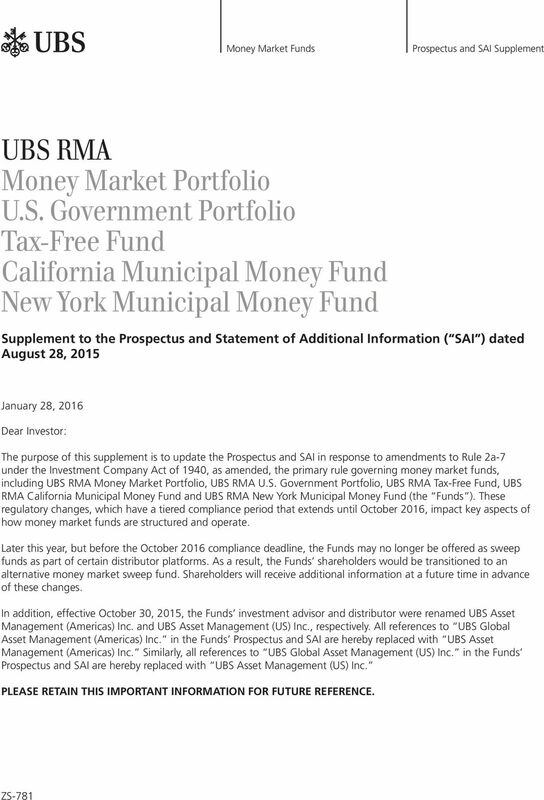 The fund has adopted a policy to invest 99.5% or more of its total assets in cash, government securities, and/or repurchase agreements that are collateralized fully (i.e., collateralized by cash and/or government securities) in order to qualify as a government money market fund under federal regulations. 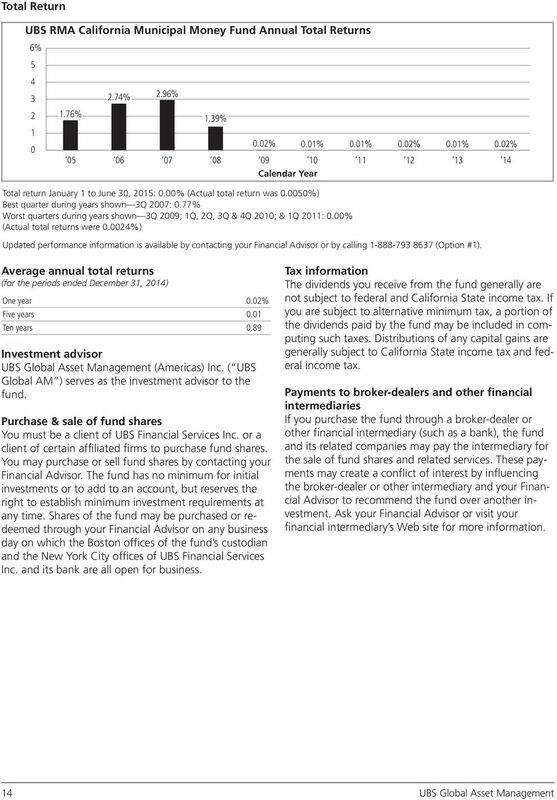 In addition, under normal circumstances, the fund invests at least 80% of its net assets in US government securities, including government securities subject to repurchase agreements. 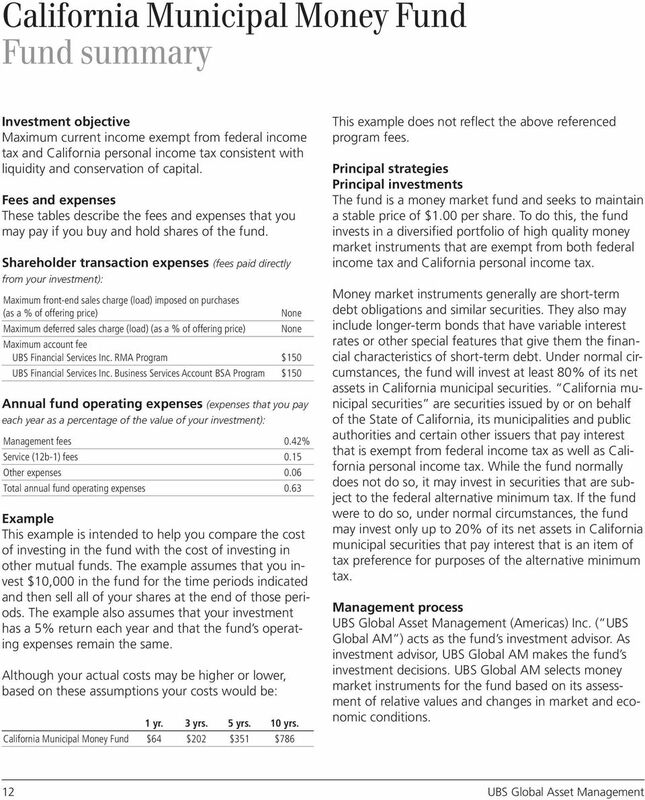 Many US government money market instruments pay income that is generally exempt from state and local income tax, although it may be subject to corporate franchise tax in some states. 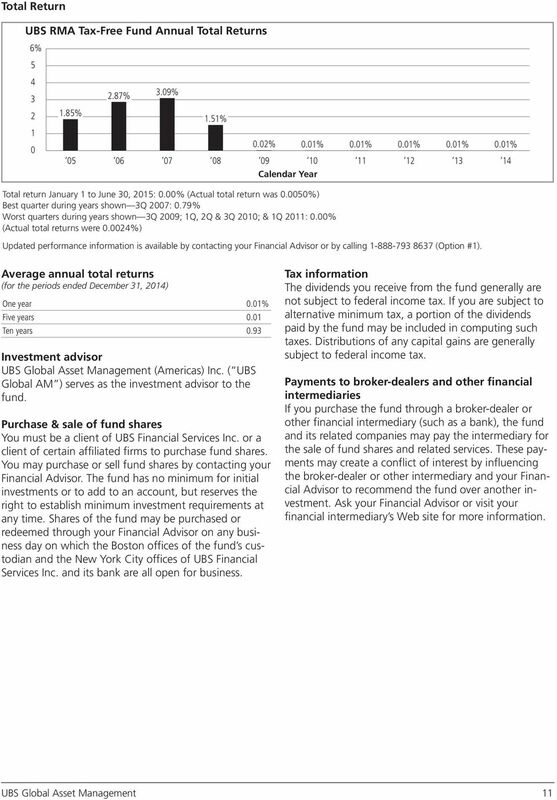 The fund may invest a significant percentage of its assets in repurchase agreements. 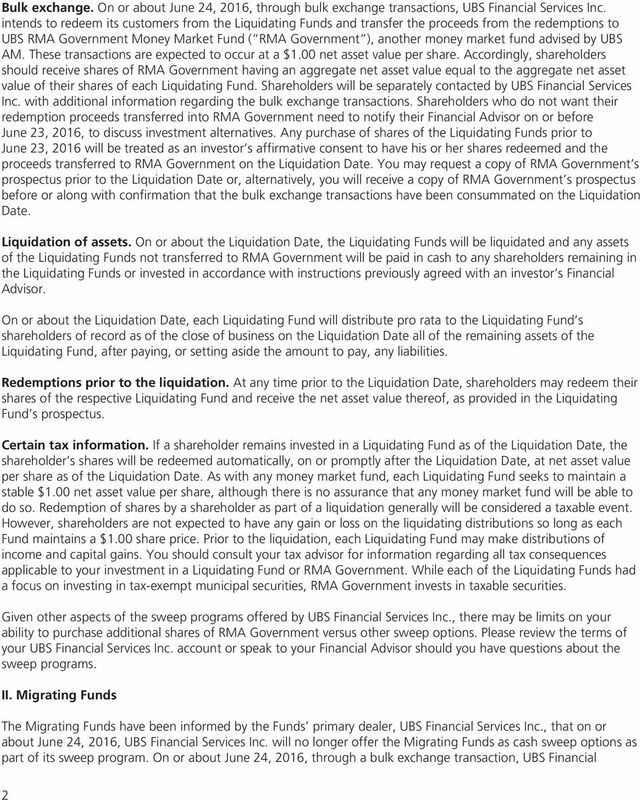 Repurchase agreements are transactions in which the fund purchases government securities and simultaneously commits to resell them to the same counterparty at a future time and at a price reflecting a market rate of interest. Income from repurchase agreements may not be exempt from state and local income taxation. Repurchase agreements often offer a higher yield than investments directly in government securities. 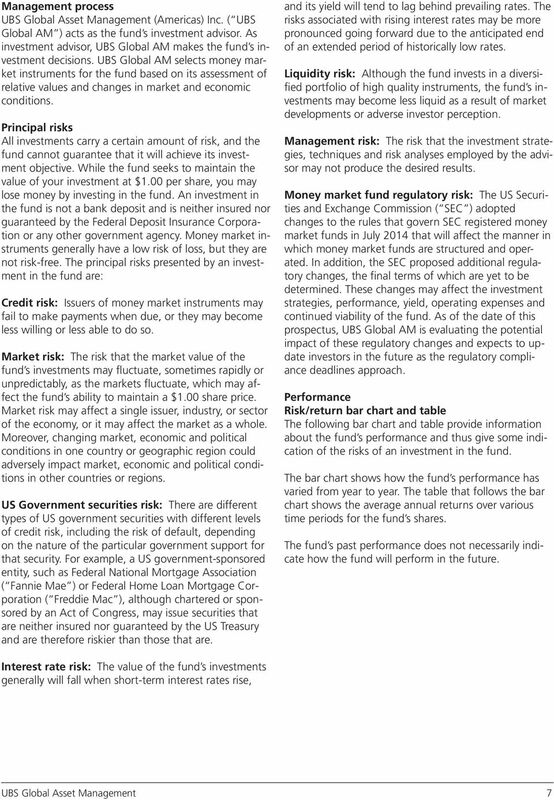 In deciding whether an investment in a repurchase agreement is more attractive than a direct investment in government securities, the fund considers the possible loss of this tax advantage. 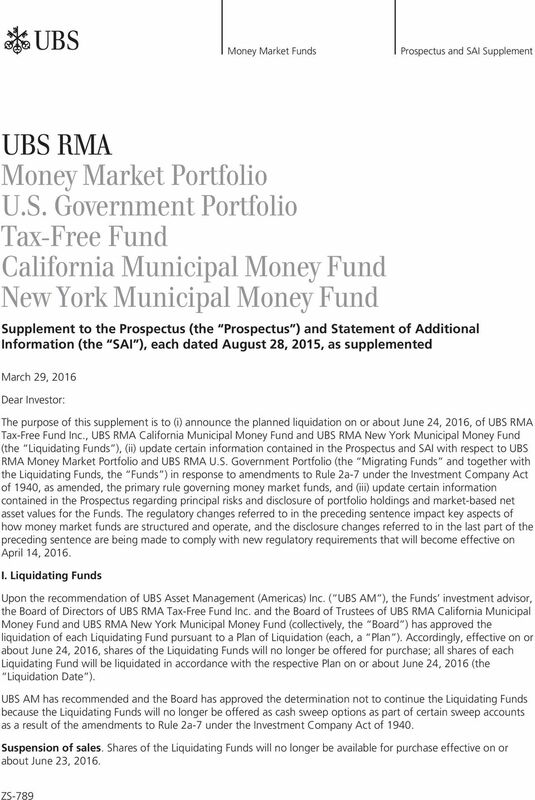 Effective June 1, 2016, the Prospectus is hereby supplemented accordingly as shown below.